MARDAN, Pakistan (CNN) -- Inside a hospital ward in northwest Pakistan, I found myself surrounded by sobs and screams. One scream was so high-pitched that I didn't think it was human. These were the sounds of agony, and they belonged to innocent civilians who were injured in the cross fire of Pakistani troops and the Taliban in the Swat Valley. CNN's Reza Sayah with Shaista, who lost most of her family in an explosion as they fled fighting. Behind each cry at this ward was a story of loss. Doctors told me no one here had lost more than Shaista, an 11-year-old girl who watched as an explosion instantly killed most of her family. Shaista and her family were among hundreds of thousands of people who fled Pakistan's Swat Valley on the day the Pakistani Army launched an all-out offensive against the Taliban. She says she was walking along a road with her family when a mortar shell suddenly fell from the sky. Doctors said the explosion shattered Shaista's foot. Moments later she passed out. The next time she woke up she was in the female orthopedic ward of the GHQ Hospital in Mardan. Doctors said Shaista will recover from her shattered foot, but the trauma of losing a family will last a lifetime. "She kept saying it all happened in front of me," said Salma Shaheen, a nurse. "She said something fell on top of my mother and she got cut in half." It was clear that Shaista had won over the hearts of the doctors and nurses who said that they, in three days, had treated more than 800 civilians injured in the battle zone. Shaista said her father is missing. 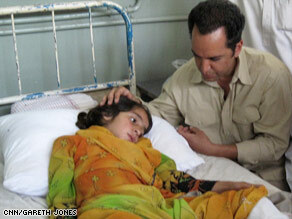 Her only guardian is her uncle, Muhammad Sher, who found Shaista after searching area hospitals. "I'm just going to tell her, 'you're my daughter,'" said Muhammad. "I'm going to educate her, teach her the Koran and do what I can for her." Sixty miles away from the hospital, the battle between Pakistani troops and the Taliban raged on. On Wednesday General Athar Abbas, the army's top spokesman, told CNN the troops were making significant progress but the most intense stage of the fighting in the battle zones' most populated areas was still to come -- a near guarantee of more sobs and screams at area hospitals.